Welcome to the seventy-second issue of MetaboNews, a monthly newsletter published in partnership between The Metabolomics Innovation Centre (TMIC, http://www.metabolomicscentre.ca/) and the international Metabolomics Society (http://www.metabolomicssociety.org/), to keep metabolomics researchers and other professionals informed about new technologies, software, databases, events, job postings, conferences, training opportunities, interviews, publications, awards, and other newsworthy items concerning metabolomics. MetaboNews represents the one-stop-shop for the very latest and most critical news about the science of metabolomics. In this issue, we feature a Metabolomics Spotlight article from IROA Technologies LLC titled "Metabolomics: Do we really know how many unknowns there are in a data set? (and how to find out)", and a metabolomics interview with Seyed Ali Goldansaz of the University of Alberta. The Metabolomics Society is calling for interested members in the Greater Asia region to express their interest in hosting the 2020 annual Metabolomics Society meeting (http://metabolomics2020.org/). Please send notice of your interest using this form by 15th September 2017. You should name individuals who will be key to forming a Local Organizing Committee (LOC), and outline the scientific plan for the conference. The LOC will report to the Metabolomics Society and assist A-S-K staff to select a suitable venue and organize the conference. The tasks of the LOC are to ensure national and regional support for the conference, to assist the Society in administrative planning and, most importantly, to chair and organize the scientific management of the conference, including forming an International Organizing Committee that has the responsibility for scientific aspects of the meeting. Please complete the application form outlining your ideas to maximize the scientific quality and outreach of the conference. For further enquiries, please contact the Society via A-S-K Associates (metabolomics@askusa.com). So, we finally got to all (well, nearly all) meet in person! For those not familiar with this section, most of the Board’s work is done through teleconferences, but for the international meeting we hold a Board of Directors meeting at the start of the conference. It was very reassuring that we were already hearing great things about the Sunday workshops at the meeting! At the face-to-face Board meeting we finalized the details for the election of new Board members and members of the Early-career Members Network, so I encourage you to apply to either or both! One agenda point I want to flag is we voted on the split of the Conference and Training Committee into two separate committees. Given the importance of the conference each year, it tends to dominate the current combined committee. By forming a new Training Committee, we hope to prioritize training activities, particularly in regions of the globe where Metabolomics is still developing. If you are involved in a training activity, such as a workshop or summer school, please contact the chair of the committee, Christoph Junot with your ideas. Finally, I would like to say a thank you on behalf of the Board to all those that made the conference possible – Melissa and Horst for being the ultimate hosts (and their ice cream), the Local Organizing Committee, the Scientific Organizing Committee, the student volunteers in their purple tops, our Sponsors, A-S-K Associates and everyone else that made the conference so special. Seattle has a lot to live up to! 2017 Board of Directors – Election Opening Soon! All members of the Metabolomics Society are welcomed and encouraged to participate in the 2017 Board of Directors election, which will open during the first week of August. An email will be sent to all members once the poll is open. Voting will be open through August 25, 2017 at 11:59pm USA CST. You can find a list of the nominees as well as their biographies and statements of interest on the Election page of the website. NOTE: All members are required to enter the email address associated with their membership to complete the online voting. Please contribute to shaping the future of our Society by voting and playing an active role. Thank you to all who participated in the membership survey. We had a great response and hope the data collected will help the Society effectively plan in the future. The Metabolomics Society would like to know how to better serve non-members and potential new members and we want to know what you think! Take 5 minutes to help the Metabolomics Society by completing a short survey. To complete the survey, click here: https://www.surveymonkey.com/r/MetabolomicsSociety. Up to 300 words on why you fit the role, and up to an additional 300 words (one page in total) on what ideas you are passionate about developing as part of the Early-career Members Network. Successful candidates will be notified by the end of September 2017 to start in October 2017. Additional information can be found at the EMN page on the Metabolomics Society website here. Please contact us via info.emn@metabolomicssociety.org if you have any question or need more clarification. The European Centre for Ecotoxicology and Toxicology of Chemicals (ECETOC) has announced the launch of a new initiative which will accelerate the use of metabolomics technology to improve the safety assessment of chemicals. Metabolomics is the study of the myriad of small molecules in biochemical pathways that sustain life, by generating energy, or building larger molecules such as DNA. This technology has the potential to transform chemical risk assessment by providing a deeper view of the molecular events underpinning toxicity than is currently possible. However, because it is so new, scientists do not yet have standard procedures for applying metabolomics or reporting its findings, both of which are needed for chemical risk assessment. The MEtabolomics standaRds Initiative in Toxicology (MERIT) brings together a team of international experts to address this problem by defining best practices and minimum reporting requirements when metabolomics is used in regulatory toxicology. It comprises partners from industry, government agencies, regulators and academia, from across Europe and the USA, including the US EPA, US FDA, EFSA, UK HSL, BASF HE, Syngenta, Unilever, Imperial College London, University of Birmingham, VU University Amsterdam and the Metabolomics Society Data Standards Task Group. Alan Poole, Secretary General of ECETOC explains that “Omics has enjoyed a great deal of success in research. Nevertheless, the use of omics data in regulatory assessment has been hindered by the different approaches to the acquisition and processing of the data which can lead to different outcomes, even from identical studies. By focusing on gene expression and metabolic phenotyping, we can gather significant complementary information on regulatory processes and downstream function – both critical to understanding mechanisms of toxicity”. Mark Viant, co-chair of the new group states “We need to address all the roadblocks to translating this highly effective technology of metabolomics into mechanism-based chemical safety science”. Tim Ebbels, also co-chair, added “The MERIT project is a critical step towards that goal”. For further details, or to express your interest in commenting upon the best practices and reporting requirements, please contact Dr Tim Ebbels (t.ebbels@imperial.ac.uk) or Professor Mark Viant (m.viant@bham.ac.uk). ECETOC is an Industry-funded, not-for-profit, non-political science based organization with access to chemical industry’s scientific experience and expertise focusing solely on the science of chemical risk assessment for regulatory purposes. ECETOC provides a scientific forum for expert collaboration from world-wide industry, academia and regulatory bodies to develop Tools, Guidance, State of Science on how emerging science builds on existing risk assessment frameworks. It does this through Task Forces, Expert Meetings and Workshops. A good knowledge of Chemistry is useful for the analytical and bioanalytical aspects of Metabolomics. ANZMN members Associate Professor Oliver Jones and Associate Professor Michelle Spencer (and a great team of computer science students) have developed a new game-based app called 'Chirality 2' to help teach some fundamental concepts for first-year Organic Chemistry in a fun and innovative way. The app uses drag and drop, touch-screen interfaces for users to solve puzzles, answer questions, earn medals, and sharing results with their friends via social media. The topics covered are functional groups, structure classification, intermolecular forces, isomers, chiral carbons and naming of molecules. There are timed modes and also feature fun facts about structures. You can get instant feedback and track your progress as you go. The app is available on both Android (https://play.google.com/store/apps/details?id=rmit.edu.au.oliverjones) and iTunes (https://itunes.apple.com/us/app/chirality-2/id1251289926?mt=8). Professor Ute Roessner: In recognition of her pioneering work to the field of plant metabolomics and positioning Australia at the forefront of plant metabolomics. She has also made a significant contribution to the Metabolomics Society as a member, director, secretary, immediate past president and co-founder of the Australia and New Zealand Metabolomics Network, the first international affiliate with the Society. Professor Masaru Tomita: in recognition of his outstanding contributions in establishing the Metabolomics Society as one of the original board members, host of the first international conference in Tsuruoka in 2005, and co-organizer of the 10th International conference in Tsuruoka in 2014. He is one of the strongest proponents of CE-MS approaches and has a sustained record of academic contributions to metabolomics internationally. In addition, we made a number of studentship and early-career members network awards to aid those at the start of their scientific career to attend the meeting. The inability to distinguish between noise and true biological data is still a major challenge to metabolomics researchers although there are many more tools becoming available to deconvolute sets of peaks or metabolite features (mass-to-charge, chromatographic retention time, isotopic pattern, fragmentation). The goal here was to construct a specific study using IROA1,2 generated samples and perform an in-depth LC-MS analysis of the peaks in these samples to determine how many unknowns were in the dataset. The number of unknown (unnamed) compounds in a metabolomics dataset is generally two or three times more than the number of known (named) compounds. How can it be that there are so many unknowns when biochemistry is such a mature science? Years of observations have given us several clues. We often see the same compound more than once. We know this is in defiance of the principles of chromatography and is therefore dismissed as an artifact of the "look-it-up-in-a-database" method of naming things that is the basis of most non-targeted platforms; however, many of these features are structures unique to their molecular formula and we know that metabolites can ionize as several adducts. Sometimes we see visible patterns of peaks in a 2-D overview and we know that chromatography isn’t perfect, so these features are most likely all real. There are also too many unknowns with masses that do not easily translate to molecular formula, and these we tend to dismiss because they are not believable. Using accurate mass databases to identify metabolites is common but unless retention time and isotopic pattern information are considered, specific compound identification is improbable. The interpretation of fragmentation data adds a level of time-consuming complexity if standards are not available. 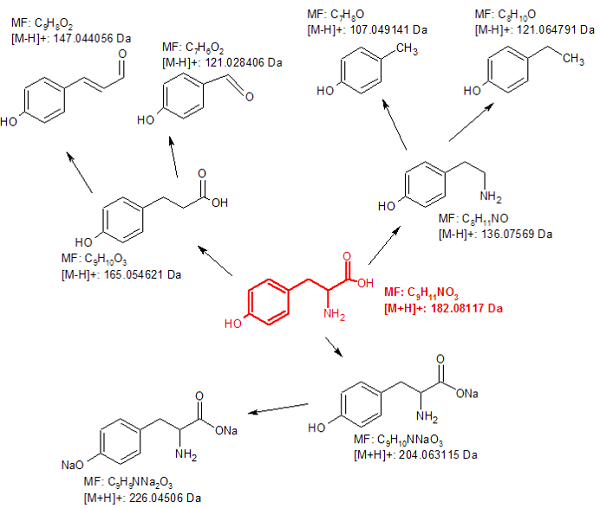 This study adopted an experimental design in which: 1) all molecules of biological origin may be distinguished from molecules not of biological origin (see Figure 1); 2) due to the nature of the IROA signature, the number of carbons and the formula of any molecule could be determined; and 3) four metabolite features (mass-to-charge, chromatographic retention time, isotopic pattern, and fragmentation) were combined to achieve accurate identification. Figure 1. 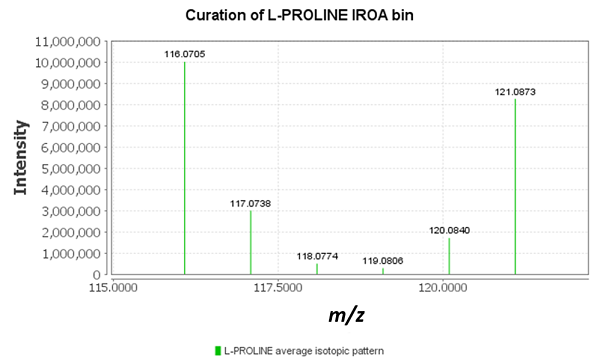 The IROA pattern for L-proline is that of a five-carbon molecule with a C12 base mass at 116.0705. Note the spacing of peaks is exactly a neutron mass apart, and the peaks are symmetrical. Complex IROA Internal Standards were generated by growing yeast until fully labeled in media whereby all carbon sources were labeled with either 5%- or 95% -U13C. Equal aliquots of cells were pooled, extracted and subjected to LC-MS to yield perfect mirror-image patterns (Figure 1). The resulting "IROA-Matrix" material, in which every molecule was specifically isotopically labeled, was analyzed in triplicate. Standardized peak picking was performed to determine how many peaks would be found in a “normal” metabolomic dataset. This was followed by a deep annotation of all the IROA peaks using IROA ClusterFinder™ software. The experiment was repeated on multiple instruments. Since all biological peaks were labeled, we knew that all unlabeled peaks were non-biological. A standard peak-picking process, using mzMine, found 3,200 peaks on average, in each of the "IROA-Matrix" files when analyzed with a minimum peak height of 100,000. 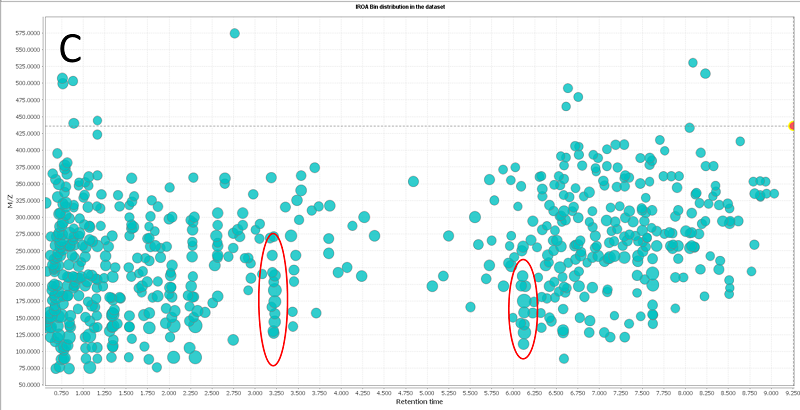 The ClusterFinder program at the same setting (minimum = 100,000) found only 781 IROA peaks. Since all the biological peaks yielded an IROA pattern, of the 3,200 peak picked peaks, 2,419 (74%) were artifacts (Figure 2). Figure 2. Peak-picking yielded peaks of biological (Orange), and non-biological (Blue) origin. Only 24% of the peaks had isotopic signatures and originated from the sample analyzed; the remainder were natural abundance. Among the peaks of biological origin, there were still a lot of unknown peaks. To see if these could be in-source, or instrument-induced fragmentation, we created a software package that allowed us to select any peak and find all highly correlated peaks (i.e., fragments, adducts and polymeric derivatives) (Figure 3). For any selected peak, correlated peaks were identified and a matrixed table was generated in which the degree of correlation was below the diagonal, and the mass differences were above the diagonal (Figure 4A). From this table and the IROA-derived data, it was generally possible to determine the exact fragmentation sequence (Figure 4B), and once it became obvious that there was a tremendous amount of post-LC fragmentation, it became easy to recognize it as columns of peaks in a 2-D representation of the peaks (Figure 4C). Figure 3. The positive-mode fragmentation of a few of the amino acids illustrate how many fragments, adducts, or polymerics may be seen for some molecules. The peaks in this table are all in addition to the normal M+H. Figure 4. The correlation table exhibits the mass difference between any two correlated peaks above the diagonal. The fragmentation sequence may be read from the connections seen here. It was easily determined that a large percentage of peaks found in a basic peak picking routine were artifacts was since these peaks did not exhibit IROA patterning. Of the IROA-patterned peaks, a chemical formula was accurately determined and many compounds were identified by comparison to authentic standards from the MSMLS3. Compounds for which standards were not available were identified tentatively by reference to the Clusterfinder™ embedded databases, and formulae calculations were attempted for all others. Among the biologically derived peaks were 1) known authenticated, and tentatively known compounds; and 2) unknowns either with or without formulae. Many compounds occurred multiple times. Many of the compounds occurring multiple times are common fragments of named compounds. They made chemical sense when correlated peaks were identified using algorithms and the fragmentation path was examined. 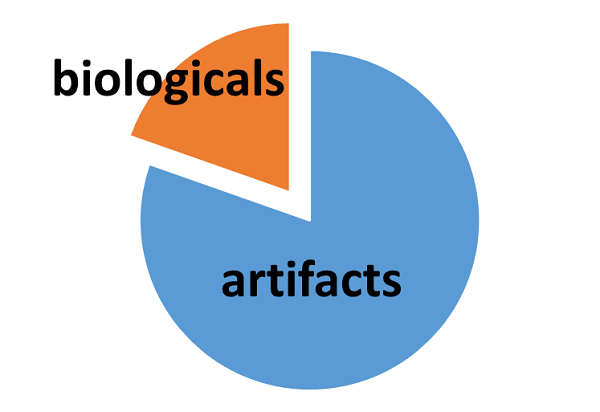 Most of the unknowns examined to date are either fragments, adducts, or polymerics. The formulae calculated from their IROA parameters are generally correct. They are often “named by lookup” and not recognized as a fragment, for instance, indoline will show up for all tryptophan-related compounds. A very limited number of the IROA peaks found could not be either identified directly or assigned relative to another known peak. These are likely the only true unknown compounds of biological origin. The IROA-Matrix has been developed into a Workflow Kit which includes Standards and software. Further information can be freely found here and the Kit User Manual obtained from the primary author of this article. de Jong F, Beecher C. Addressing the current bottlenecks of metabolomics: Isotopic Ratio Outlier Analysis (IROA®), an isotopic-labeling technique for accurate biochemical profiling. Bioanalysis 2012, 4(18), 2303-14. Stupp GS, Clendinen CS, Ajredini R, Szewc MA, Garrett T, Menger RF, Yost RA, Beecher C, Edison AS. Isotopic Ratio Outlier Analysis Global Metabolomics of Caenorhabditis elegans. Analytical Chemistry 2013 85(24), 11858-11865. doi: 10.1021/ac4025413. Mass Spectrometry Metabolite Library of Standards. This section features interviews with prominent researchers in the field of metabolomics. The aim of these interviews is to shed light on metabolomics researchers around the world and give them an opportunity to share their metabolomics story. In this issue, we feature an interview with Seyed Ali Goldansaz. Seyed Ali obtained his BSc degree in Animal Science from the College of Agriculture & Natural Resources, University of Tehran, I.R. 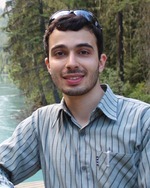 Iran, and his MSc in Nutritional Immunology from the University of Alberta. He is currently conducting research in an interdisciplinary field looking into the identification of predictive biomarkers of sheep feed efficiency, carcass merit, pregnancy and litter size using different "omics" technologies, with a main focus on metabolomics. MN: How did you get involved in metabolomics? SAG: My background is in Animal Science and, generally, metabolomics is very new in this field. When I wanted to start my MSc in 2011, I had the option of choosing between two projects for my thesis work, both of which involved metabolomics. Ultimately, I decided to do my thesis work on the effects of bacterial lipopolysaccharide on prion disease. As part of that project, I collected urine and serum samples from FVB infected-mice at different time points and conducted NMR analyses to identify and quantify the metabolome associated with prion infection. This experiment was conducted in collaboration with The Metabolomics Innovation Centre (TMIC). Over time, my collaborations with TMIC grew further and it was through their metabolomics facilities that I became more and more involved in this field. Upon completing my MSc, I had the opportunity to create a new collaboration between TMIC and Livestock Gentec (LG) at the University of Alberta to start my PhD. Currently, bridging between metabolomics and Animal Science, I am looking at identifying predictive biomarkers of feed efficiency, carcass merit, pregnancy, and litter size in sheep. MN: What are some of the most exciting aspects of your work in metabolomics? SAG: One of the exciting aspects of metabolomics is its versatility in biomarker discovery; it can be used for the diagnosis or prognosis of various traits. In my project, we are using metabolomics to identify biomarkers with a predictive value that could be used for early detection of some economical traits. For example, we hope to identify biomarkers of ewe pregnancy and litter size that would enable differentiation between pregnant and non-pregnant ewes and detect the number of fetuses carried by each pregnant animal between 40-50 days into pregnancy. Meanwhile, current practices in larger flocks using ultrasound diagnosis require highly experienced veterinarians/technicians to only detect the pregnancy and not the litter size. Another exciting aspect of my research is developing "pen-side" kits that embed the predictive biomarkers. These kits are designed to be portable, highly accurate, economically affordable, and can be used by anyone, without needing any scientific knowledge or technical capability or instrumentation. These kits are meant to provide a consistent service regardless of the size of the flock, geographical proximity, or farm accessibility. MN: What key metabolomics initiatives are you pursuing at your research centre or institute? SAG: One of my main objectives in bridging between metabolomics and sheep research is to introduce the opportunities metabolomics could provide for livestock researchers. An example is the collaboration between LG and TMIC, which provides an opportunity to couple genomics and metabolomics technologies for the sake of livestock research. To investigate the application of metabolomics in animal science, we recently published a systematic review looking at five major livestock species (cow, sheep, goat, horse, and pig) reported up to 2016. This systematic review has gathered the livestock metabolome from all publications reporting more than eight metabolites and centralized the information in a freely accessible online database called The Livestock Metabolome Database (LMDB). We identified only 149 articles reporting metabolomics data on these five livestock species. In this manuscript, we review the trends in the application of metabolomics in livestock research and point out some of the opportunities provided through metabolomics. This review and the online database (LMDB) should enable livestock researchers and producers to conduct more targeted metabolomic studies and identify where further metabolome coverage is needed. MN: What is happening in your country in terms of metabolomics? SAG: The Metabolomics Innovation Centre at University of Alberta is one of the leading centres in metabolomics with great research capacity and a multitude of collaborations with researchers in various fields. For more information on TMIC developments, please visit www.metabolomicscentre.ca. MN: How do you see your work in metabolomics being applied today or in the future? SAG: I think biomarker discovery for predictive measurements of production traits using portable kits is going to be a breakthrough for the livestock industry. We hope to take a big step towards achieving this goal by designing experiments with longitudinal sample collection to discover the predictive biomarkers, validate the results using a larger scale sample size, and implement the validated biomarkers in a pen-side kit. Farmers would also benefit from a management perspective by using these kits to predict animal performance, e.g., feed efficiency, meat yield, the number of fetuses a ewe carries, before entering the production system or very early in the trial. This additional information allows the farmers to decide whether they want to keep the animal and, if they do, how to change their management practices to be efficient and meet the needs of the animal. An example is reducing costs on overfeeding ewes that have not yet been detected as pregnant and adjusting feed for ewes carrying multiple fetuses, compared to those with only one fetus. MN: As you see it, what are metabolomics' greatest strengths? SAG: As we have described in our systematic review, metabolites are the canaries of the genome. Metabolomics can provide a sensitive indicator of how changes are being regulated at the proteomic and genomic levels. Phenotypic changes can be identified and quantified using metabolomics. Consolidating the omics technologies for a system-level understanding of how various biological processes happen is another important issue. Metabolomics data, especially when studying metabolite kinetics, can reveal some of the unknown physiological pathways and point out the important regulators of these pathways. MN: What do you see as the greatest barriers for metabolomics? SAG: I think one of the greatest barriers in metabolomics, especially for scientists new to the field, is how to apply metabolomics. Our systematic review showed that quite a few publications have done a poor job designing and conducting their metabolomics analyses. Some examples are using a low number of animal replicates or sample sizes, reporting metabolites as biomarkers while not conducting the right statistical analyses and validation for it, and not using the appropriate analytical platforms for their experiments. Another barrier for metabolomics is the dearth of quantitative data. Most publications report the metabolites they have identified, however, they do not provide any quantitative values comparing control vs treatment group concentrations, or how the concentrations have changed as a result of the treatment, or what the minimum/maximum concentrations are for the given metabolites. Another limitation may be the accuracy of metabolomics instruments and the need for method development for sensitive metabolites such as vitamins or those below the detection limit. MN: What improvements, technological or otherwise, need to take place for metabolomics to really take off? SAG: Science is endless and, as such, the need for improvement in all aspects of any field including metabolomics is constant. One of the aspects that has and will further improve metabolomics is the availability of online databases that are freely accessible and serve as a hub for the research community and industry. Imagine if you no longer had to browse through multiple web pages, all in the same field, to find the information you need but rather, one centralized web page has all that you are looking for and can provide the information anytime, anywhere at the mercy of a click or a simple search! Another improvement needed in this field is to develop instruments and/or methodologies that allow more sensitive and reproducible detection of metabolites. MN: How does the future look in terms of funding for metabolomics? SAG: It seems that in general, research funding around the globe has declined in recent years. However, more and more are becoming interested in performing and funding metabolomics research. This won’t last long if metabolomics researchers do not make a difference for the industries and governments supporting them by saving them money or increasing their profitability. MN: Do you have any other comments that you wish to share about metabolomics? SAG: Despite all the fantastic research everyone does, I think we should remember that research and doing good science is just one aspect of our lives. We shouldn’t forget who we are, why we are doing what we’re doing, and where we are heading. I’ve come to learn by experience that regardless of how excellent your research is, it will one day become old and people may forget about it; however, if you want to become eternal, you should capture not only the minds, but hearts too. Increasing our knowledge should increase our humility too, or else, you would be no different than a hard disk, which only carries loads of scientific material. Just like any fruit tree; the more fruitful the tree, the more curved (humble) the branches get! Please note: We are open to suggestions for our MetaboInterviews section. Please send suggestions for future interview candidates to Ian Forsythe at metabolomics.innovation@gmail.com. Livestock metabolomics and the livestock metabolome: A systematic review. Metabolomics Reveals Cu(OH)2 Nanopesticide Activated Antioxidative Pathways and Decreased Beneficial Antioxidants in Spinach Leaves. HIF-1α inhibition by diethylstilbestrol and its polyacetal conjugate in hypoxic prostate tumour cells: Insights from NMR metabolomics. Alternatives to NOESY presat and CPMG presat for NMR-based metabolomics. The use of stable isotopes in the study of human pathophysiology. Ion mobility spectrometry combined with ultra performance liquid chromatography/mass spectrometry for metabolic phenotyping of urine: Effects of column length, gradient duration and ion mobility spectrometry on metabolite detection. Metabolomic characteristics of cholesterol-induced non-obese nonalcoholic fatty liver disease in mice. Atherogenic Lipoprotein Determinants of Cardiovascular Disease and Residual Risk Among Individuals With Low Low-Density Lipoprotein Cholesterol. Lipoprotein insulin resistance score and risk of incident diabetes during extended follow-up of 20 years: The Women's Health Study. Deconstructing the Metabolic Networks of Oncogenic Signaling Using Targeted Liquid Chromatography-Tandem Mass Spectrometry (LC-MS/MS). Serum and Plasma Metabolomic Biomarkers for Lung Cancer. School on "Cloud-based Metabolomics Data Analysis and Collaboration"
We are happy to announce that registrations are now open; visit http://cloudmet2017.crs4.it/ to register now. Metabolomics is a well established -omics science whose growth is bringing about new challenges. Systematic studies and integration with other data sources are resulting in ever larger dataset sizes; production applications require superior computational scalability of analysis techniques; complex, multi-step workflows make study reproducibility more challenging. At the same time, cloud computing technologies are extending their functionality and provide practical solutions for many of these problems. In this School students will have the opportunity to learn about current topics in metabolomics, with a slant on the integration of cloud computing technologies where they are beneficial to the effectiveness and efficiency of research and analysis work. Top-level lecturers in the field will provide their insight and will be available for the entire duration of the school, with ample opportunity for interaction with the students. Importantly, the School will also include practical sessions where students can put their new knowledge into practice under the guidance of tutors and run analyses using the new PhenoMeNal cloud-based metabolomics platform. To register and for more information, visit http://cloudmet2017.crs4.it/. Not just an ordinary conference, where people present work they have already done, MOVISS is centered on identifying and problem solving current challenges relating to metabolomics data handling by getting everyone in the room discussing it. Want to be at the forefront of solving some of the major bottlenecks in the Metabolomics Revolution – see you at MOVISS! A follow up R Summer School will be held on September 25-27, 2017 in Vorau, Austria. For more information and registration, please visit http://www.openms.de/um2017/. Metabolomics is an emerging field that aims to measure the complement of metabolites (the intermediates and products of metabolism) in living organisms. In this course, we provide an introduction to metabolomics and describe the current challenges in analysing the complement of metabolites in a biological system. The course is targeted towards final year undergraduate students from biology / chemical disciplines and medical students, but will also provide a valuable introduction to the metabolomics field for MSc and PhD students, and scientists at any stage in their careers. or email: bmtc@contacts.bham.ac.uk for more information. Bursaries are now available for PhD students funded by the BBSRC, MRC, or NERC. Mayo Clinic will host a Metabolomics Symposium from October 12 to October 13 on the Rochester, Minn., campus. The event will feature presentations on the practice and theory of metabolomics applications, the latest research in metabolomics and networking opportunities. The workshop is open to beginning and established researchers, students and postdoctoral fellows. A focused workshop is available to a limited group of individuals based on availability. Scholarships for scholars and junior faculty are available. For more information, please visit http://matrix.conferenceataclick.com/metabolomics_2017/home_live1.htm. The aim of this workshop is to review the state-of-the-art and broaden the knowledge on high-throughput analytical methods, data integration and modelling in Environmental Omics and Toxicology. We are pleased to invite you to participate in this workshop that will promote knowledge exchange and creation of new relationships and future collaborations. For more information, please visit http://wenvomics2017.info/. Make plans to attend the 10th successful MetaboMeeting conference. The meeting will bring together research scientists and practitioners from all areas of application and development of metabolic profiling, covering a wide range of experience from early career scientists to experts from throughout the international metabolomics field. MetaboMeeting 2017 continues to highlight the work of its attendees through both oral platform presentation and poster sessions. The deadline for oral presentation abstracts is 15th July 2017. The deadline for poster abstracts is 1st October 2017. For further information, visit http://metabomeeting2017.thempf.org/. This two-day course will provide a hands-on approach to teach the latest techniques and tools available to perform metabolite identification. We will apply these tools on the Q Exactive and LTQ Orbitrap mass spectrometry family. The course is targeted towards students and researchers who are actively applying metabolomics.